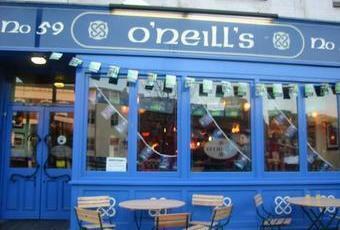 Last O'Neill's I visited was in Euston Road and that had a half-decent selection of ales on. Sadly all that was on tap here was Smithwick's. A pint was just under the £4 mark, which I guess is sadly about standard for the area. Staff were friendly enough, tables cleared of empties regularly and was a fairly comfortable place to kill half an hour without being overwhelmingly exciting or busy. Standard stuff - fairly comfortable and spacious, with the usual beers, ales, etc on tap.....at its best when showing sporting events, and there is a special menu with some pretty decent meals for �3.45.....it doesn't try or pretend to be trendy, and for that you can't be too critical. not a bad pub, but a little uninspiring - a hell of alot better than the neighbouring walkout about, and some of Angels more pretentious bars...not bad. Visited on the afternoon of New Year's Eve. No entry charge at this time of day. Uninspiring range of drinks, standard menu and reasonably polite and efficient staff. Disabled access (via passage at the side) and WC (key behind the bar). How they have the cheek to charge to get into this hovel i don`t know , designed for people with no imagination, i was unfortunate enough to have the misfortune of going here recently. Never again truly awful.